Greenwood Plantation is the setting for this Veteran's Day fundraiser benefiting the Louisiana Veterans' Foundation and the St. Francisville Area Foundation. 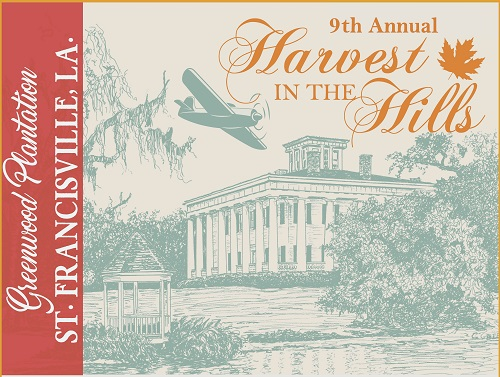 Bring your lawn chairs and picnic blankets to enjoy the plantation grounds, live music from Sara Collins and Parish County Line, and a WWII aircraft fly-over, courtesy of the Southern Heritage Foundation. • GENERAL ADMISSION: $25 in advance ($12 ages 11–17; children 10 and under FREE); or $35 at the gate. Bring your picnic blankets and lawn chairs. Food and drinks available for sale. No ice chests or outside food or drink, please. • BRONZE SPONSOR: $250. Includes 2 adult entry tickets, VIP parking, priority lawn seating (bring chairs), full access to VIP lounge food & beverage, company or individual name on event banner, "Heritage" level member status. • SILVER SPONSOR: $500. Includes 4 adult entry tickets, reserved table for 4, access to VIP lounge food & beverage, VIP parking, company or individual name on event banner, "Cornerstone" level member status. • GOLD LEVEL SPONSOR: $1000. Includes 6 adult entry tickets, reserved table for 6, access to VIP lounge food & beverage, VIP parking, company or individual name on event banner, "Legacy" level member status. • PLATINUM LEVEL SPONSOR: $1500. Includes 8 adult entry tickets, reserved table for 8, 11 am Brunch at Solitude Airstrip, access to VIP lounge food & beverage, VIP parking, company or individual name on event banner, "Foundation" level member status. • T-6 TEXAN SPONSOR: $2,000. Includes 1 flight in T-6 Texan aircraft prior to event (8 available), 4 tickets to "Harvest in the Hills", Reserved table for 4, 11 am brunch at Solitude Airstrip, VIP parking, full access to VIP Lounge food & beverage, company logo or individual name on sponsor banner, "Foundation" level member status. • EVENT PARTNER: $5,000. Includes 1 ride in WWII P-51 Mustang prior to event (only 2 available), 6 tickets to "Harvest in the Hills," reserved table for 6, 11 am brunch at Solitude Airstrip, VIP parking, full access to VIP Lounge food & beverage, company logo or individual name displayed on sponsor banner, "Partner" level member status. * Make a day of it! Planning to attend Country Roads' 35th Anniversary Celebration Supper Club, taking place today at The Myrtles Plantation from 4 pm? When buying tickets to Country Roads' event, enter the code CR35 to get $10 off the ticket price.